The chairman and ranking member of the Senate Foreign Relations Committee have written to the president demanding that his administration “make a determination” about whether Saudi Crown Prince Mohammed bin Salman was responsible for the killing Jamal Khashoggi. Sens. Bob Corker, R-Tenn., and Bob Menendez, D-N.J., wrote the letter to President Donald Trump on Tuesday, asking for an investigation under the Global Magnitsky Human Rights Accountability Act. The act requires the president to determine whether a foreign person is responsible for an extrajudicial killing, torture or other gross violation of internationally recognized human rights against an individual exercising freedom of expression. Sen. Lindsey Graham, who is close to President Donald Trump, is disagreeing with the president’s decision not to further punish Saudi Arabia over the death of Washington Post columnist Jamal Khashoggi. The South Carolina Republican sided with Sen. Rand Paul, a Kentucky Republican, and Democratic colleagues in Congress in denouncing the president’s decision, adding America should not lose its “moral voice” on the international stage. Graham said it is not in U.S. national security interests to “look the other way when it comes to the brutal murder” of Khashoggi, a Saudi citizen who lived in the U.S. and wrote columns critical of the royal family. Graham said he thinks there will be strong bipartisan support in Congress for serious sanctions against Saudi Arabia and members of the royal family. 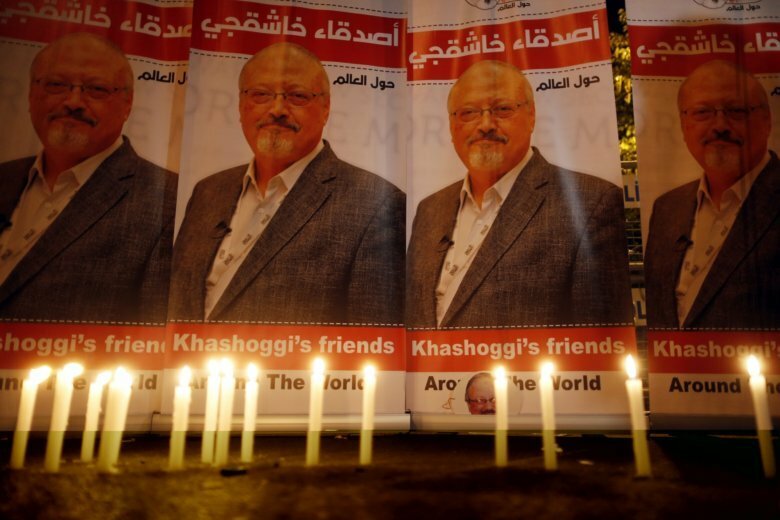 The Washington Post is denouncing President Donald Trump’s decision to refrain from further punishing Saudi Arabia for the death of Jamal Khashoggi, a Saudi writer based in the U.S. who wrote columns for the newspaper critical of the royal family. In a statement published on Twitter, Post Publisher Fred Ryan accused Trump of putting personal relationships and commercial interests above American values of respect for human rights to continue to “do business as usual” with the Saudi crown prince. Ryan further stated that the CIA had “concluded with high confidence” that the crown prince directed the Oct. 2 killing. Ryan added that if there is reason to doubt these findings, Trump should immediately make that evidence public. Trump told reporters on Tuesday that the CIA never made a “definitive” conclusion about who was responsible. Republican Sen. Rand Paul says it’s a “mistake” for President Donald Trump to continue supporting arms sales to Saudi Arabia after the death of Saudi columnist Jamal Khashoggi. Trump has praised Saudi Arabia as an important ally and said he’s not convinced Crown Prince Mohammed bin Salman was directly responsible for Khashoggi’s death. Paul says selling arms is not a “jobs program,” and the U.S. should not reward Saudi Arabia’s “bad behavior.” He says he has the votes in the Senate to block it. Trump was questioned at the White House about his decision not to further punish Saudi Arabia for the death of the U.S.-based columnist for The Washington Post, who had been critical of the kingdom. He said oil prices would “skyrocket” if the U.S. made a “terrible mistake” to break with Saudi Arabia. Trump said he was not going to “destroy” the world’s economy by being “foolish with Saudi Arabia,” adding that the United States needs Riyadh as a counterbalance to Iran. President Donald Trump says the U.S. will not levy additional punitive measures at this time against Saudi Arabia over the killing of Jamal Khashoggi (jah-MAHL’ khahr-SHOHK’-jee). Trump said in a statement Tuesday that the U.S. does not condone the killing of the U.S-based Saudi columnist, but that “foolishly” canceling $110 billion in arms sales — as some in Congress have suggested — would only mean that Saudi Arabia would go to other countries to acquire them. Trump says the king and crown prince of Saudi Arabia “vigorously deny” any knowledge of the planning and execution of the Oct. 2 murder of The Washington Post columnist at the Saudi Consulate in Istanbul. President Donald Trump is facing pressure to take tougher measures against Saudi Arabia over the slaying of writer Jamal Khashoggi (jah-MAHL’ khahr-SHOHK’-jee). It’s unclear if the president will decide on a response before he leaves Tuesday for the Thanksgiving holiday.